When you’ve worked hard all month you should treat yourself a lunch of quality food that you’ll love. The “Last Friday Working Lunch” will become a repeat entry in your diary making your final lunch of the month a culinary experience while you meet, and dine with, like-minded business owners and professionals. Open from 12 noon for open networking we sit down at 12.40 to eat. Nuovo’s cicchetti (Italian small plates) are perfect for a quality, sociable dining experience. Our chefs will present a range of delicious plates to share whilst you open up your dialogue the business folks around you. 1.30 we will have networking announcements. Once replete with a “cicchetti” lunch, diners are welcome to use our super venue to continue to build business relationships over a cappuccino, latte or dare I say, as it is the last Friday, a decadent cocktail or glass of vino. An attendee sheet will be provided with details of everyone who registered for the lunch. There’s no membership or restrictions. The only presentation you will have to endure is the lunch itself. Attendance is limited to 30, so if you book and cannot make it please to let us know the day before. If you haven’t booked but want to simply show up at the last minute we WILL make you welcome. Lunch will be £15.00 payable on the day cash or card only. 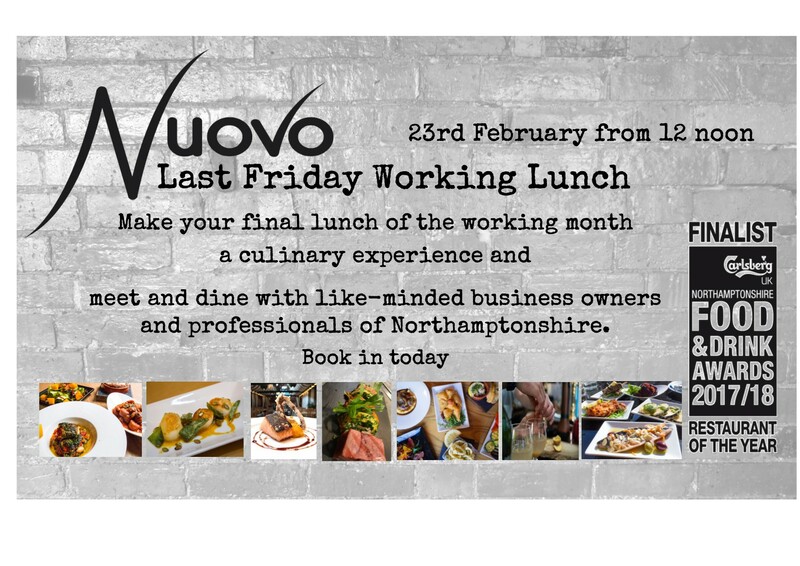 Book early, this a tremendously good value opportunity to dine at Nuovo let alone meet some of Northamptonshire’s finest. It will sell out quickly!